There are over 400 varieties of Mangoes, most of them are available in the summer time. Rich in vitamin C, A and B6, these sweet fruits are delicious on desserts, sauces and even mixed into cooked rice(Thailand makes an awesome Rice and Mango dish!) 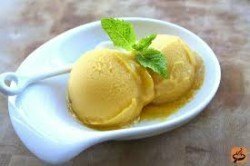 The following Sorbet recipe is easy, just make sure that your Mango is ripe enough to be sweet and cut it in small pieces before you freeze it. Serve with shaved Coconut meat, fresh berries or even an Almond Biscotti. Slice the Mangos and place in the freezer until ready to use. Don’t forget to include fruit around the stone. Place the fruit in a food processor or blender. Add the maple syrup and blitz for 1 minute. Add the coconut milk and lemon juice, and briefly blitz to combine (a few seconds). Serve the sorbet in bowls, or scoop into ice cream cones. (To make scooping easier, take the sorbet out of the freezer 10 to 15 minutes ahead of time). Add any topping of your choice like fresh coconut, raw seeds, etc.